We took a little detour yesterday and took our clients to lunch at Magness Lake. We are so fortunate to have a large flock of Trumpeter Swans that spend each winter here with us in Heber Springs. They are the second largest bird in North America with a huge wind span and a very large black beak. 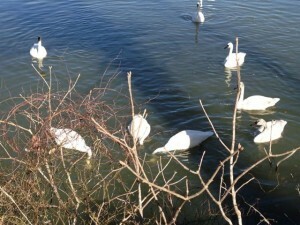 Magness Lake was donated by a local family to the Arkansas Game and Fish Commission for the protection of the swans. Yesterday was a beautiful winter day and the fly fishing on the Little Red River has been quite good. The water level has been quite high but the streamer fishing has been good. We should start seeing the March Brown hatch on the lower river very soon which is some of Bo’s favorite fishing time. Hope to see you on the river soon and be sure to keep an eye out for the Trumpeter Swans!